Securifi has recently updated the Almond+ firmware and cloud server to address the most critical feature deficiencies that I noted in my January review. Of particular note, Securifi has added limited IFTTT support and sunrise/sunset rule capability. I’ve updated our Almond+ hardware to the latest firmware and will soon be putting it through its paces. With these firmware and cloud additions coupled with the recent Almond+ price drop, I encourage you to give the Almond+ some thought when considering a home automation controller – particularly if a simple to set up, all-in-one wireless router and a simple, locally controllable home automation hub appeal to you. Every once in a while, you hear an announcement for a product whose promised features just resonate with you. The Kickstarter announcement for Securifi’s Almond+ combination gigabit wireless AC router and smart home hub was just that kind of experience for me. The idea of having a single device that can control all the wireless needs for your home from a single box – with its own touch interface definitely has its appeal. The Almond+ includes an impressive device and protocol capability including wireless b/g/n/ac (AC1750) channels, five 1 gigabit ethernet ports, Z-Wave and Zigbee interfaces, and promised future Bluetooth LE support via an added USB device. User interface options abound including a built-in touch panel, both local and web-based browser interfaces, and IOS and Android mobile device applications. 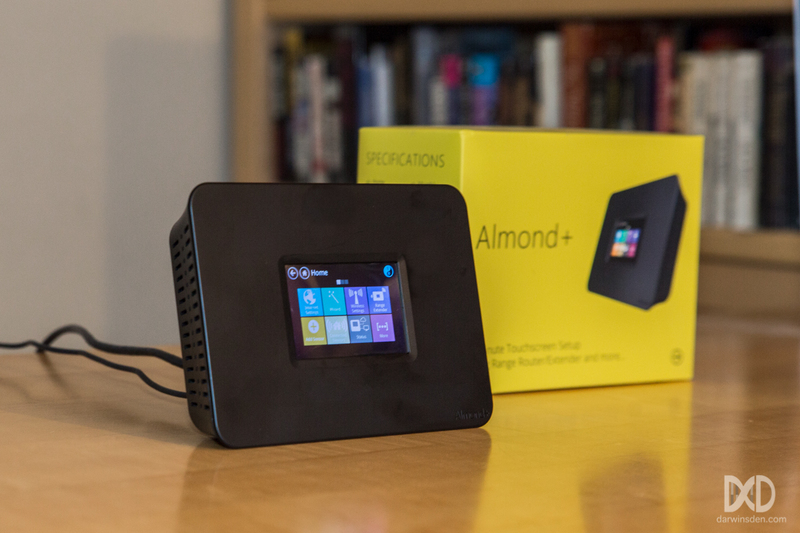 Securifi offers a free cloud service, and if all that weren’t enough, the Almond allows for local control of your devices without an internet connection via your mobile device, the local web application, automated rules, and the built-in LCD panel. We had also found that when people were purchasing this product, they were also getting a home security camera online viewing system installed so they all work with one-another. I’ve been putting the Almond+ to the test now for several months. Following is a review of my experiences with this device, which are both encouraging and disappointing. I still believe the basic concept for the Almond+ is sound and Securifi may be exactly the company that can pull off this feat, but they still have a few hurdles to jump over to get there. The Almond+ device hardware fits the bill quite nicely. It feels solid, and although the built-in 3 x 2 inch LCD display does not have a glass face, it feels substantial enough to me to handle normal operational abuse. 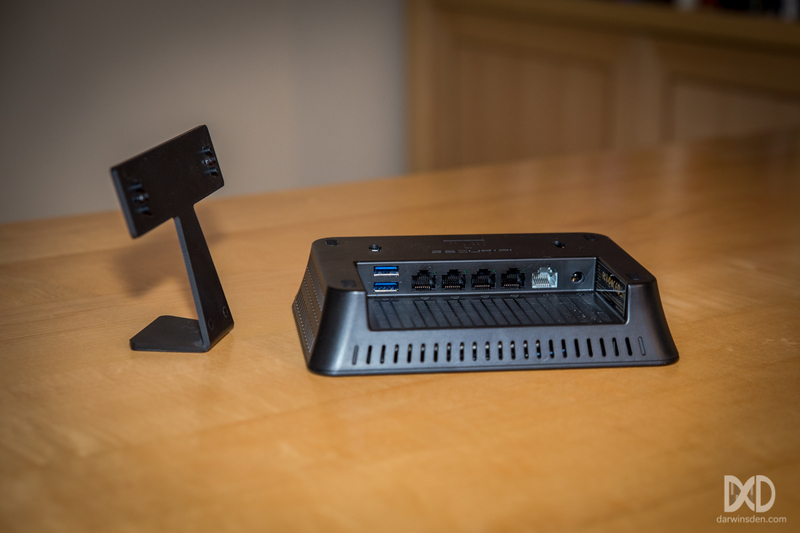 The device’s overall dimensions are 7.3 x 5.4 x 1.7 inches and the packaging includes a snap-on stand and optional wall mounting hardware. On the back, the unit includes two USB ports, five 1 Gb/s ethernet ports, and input for the 12V, .8A AC/DC power adapter. A somewhat hidden switch at the top of the unit allows you to do a factory reset if needed. 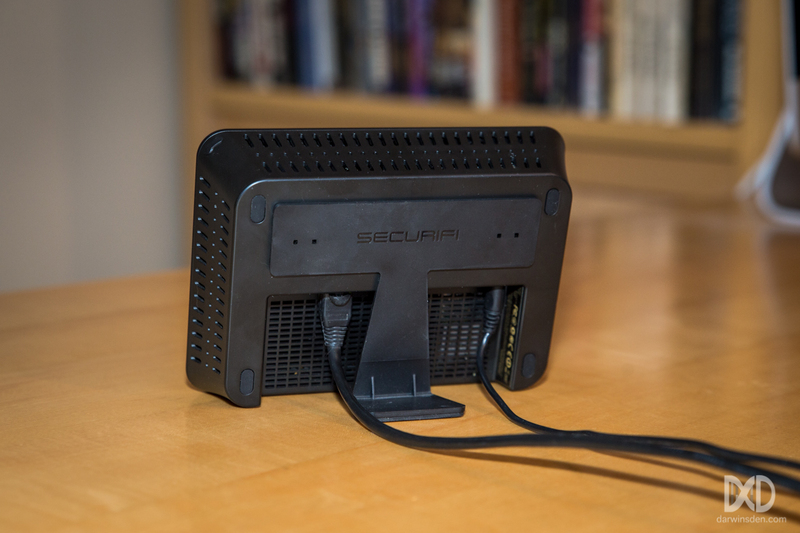 Securifi boasts a 3-minute setup process using the built-in LCD display. I didn’t set a timer during the setup process, but 3 minutes is a fair estimate of how long it took me for the base router setup. During the setup process, I configured the Almond+ in router mode, but you also have the option to configure it in range extender mode on your existing wireless network. In range extender mode, the Almond+ can extend the reach of your current wireless network and also allows you to place your unit in a more centralized location for LCD panel access or for better connectivity to your home automation devices. Pairing of home automation devices was straightforward using the LCD display (which is currently the only option right now for adding devices). I was able to quickly and easily add several GE/JASCO wall switches, An Everspring flood sensor, a First Alert Z-COMBO smoke detector, and the Securifi Peanut Zigbee switch – which much to my surprise was included with the Almond+ unit I purchased on Amazon.com. I used the Almond+ to replace our Apple Airport Extreme Wireless N router, and the transition was seamless. My family consistently has several desktop computers, laptops, iPads, a networked printer, and a networked backup drive connected. Using the Almond+, we regularly stream music and movies to our AppleTV and only rarely experience even minor hiccups. With the Almond+ serving our basic wireless needs, backups to our network drives are now being performed at a fraction of their previous time and we now receive a much stronger signal out on our back yard patio. The Almond+’s user interfaces are quite intuitive. I’ve rarely needed to visit the Securifi Wiki or forums for support. That said, the home automation capabilities of the Almond+ are still in their infancy compared to more mature home automation controllers such as those from Universal Devices, Vera, and HomeSeer, and the DarwinsDen.com top rated Samsung SmartThings. I have experienced no issues with manual control of my home automation devices using the Almond’s interfaces, but manual device control is only part of the picture. Using the Almond+ local web interface, I was easily able to set-up rules to turn my hallway and front porch lights on at night, but as the time of sunset rapidly changed during the fall, the lack of sunrise and sunset time-based rules became quite annoying. I’ve had to go back and update these rules now several times. I also added a Z-Wave switch with a simple 24V AC adapter connected to control the valve to our garden drip system. While this worked well with the Almond+, I missed having the ability to use weather conditions as an input to the rules. 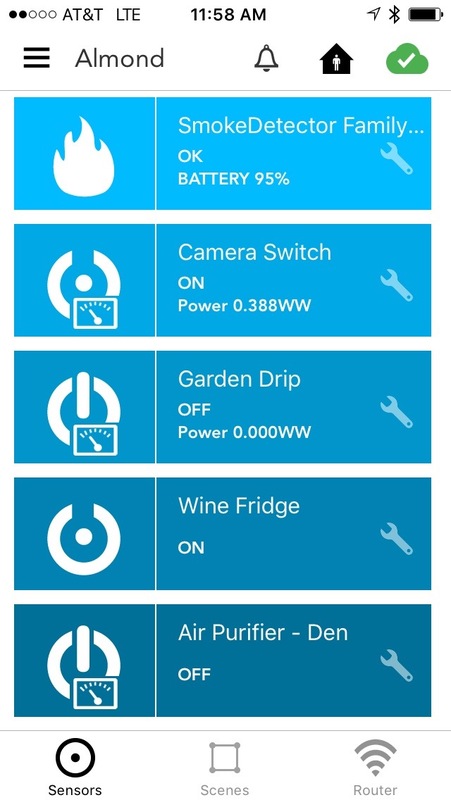 Since the Almond+ doesn’t support IFTTT or another means to provide weather input data, I needed to manually turn off the automatic watering rules during a particularly wet fall week. The Almond+ has a simple and intuitive interface for adding push notifications to your mobile device based on device state changes, such as when a door is opened, or water or smoke is detected. While this capability worked fine for me, the ability to send email and SMS text notifications which are common features of several other home automation controllers is noticeably lacking. Securifi has recently updated its firmware to support Nest thermostat integration, as well as the ability to add network devices as presence sensors on your home automation system. In my initial testing, both of these newer capabilities worked well. Adding our Nest to the Almond took only a few minutes, and I was easily able to set up rules to turn our front porch light on if either my phone or wife’s phone joined the network during the time we would normally expect to arrive home at night. In addition to home automation device control from the mobile interface, the Almond+ also provides router controls, allowing you to configure your network, reset devices, and even reboot the router remotely if needed. I really like the convenience of the built-in display control panel – and the idea of having a single device serving both router and home automation needs. The router capabilities definitely worked well for us and I really wanted to be able to recommend this device. I do like Securifi’s approach to both the hardware and software. What has been implemented to date has been measured and intuitive. The integration of the mobile device user interface to both the cloud service and local hub is very well done. Unfortunately, the current lack of automation interface features such as email, SMS text messaging, IFTTT, and sunrise/sunset rules make this device difficult to recommend for the more serious home automation enthusiast. I am confident that Securifi will continue to actively update the firmware, although progress has been somewhat slow to date. Much to the dismay of many of the Almond+ active forum participants, Securifi has not yet provided a roadmap regarding if and when these features might be added in the future. The Almond+ may satisfy your needs if 1) you are looking for an upgrade to your existing wireless router, 2) the simple touch interface appeals to you, and 3) you like the idea of managing some limited home automation needs without adding yet another box and associated wires to your shelf. 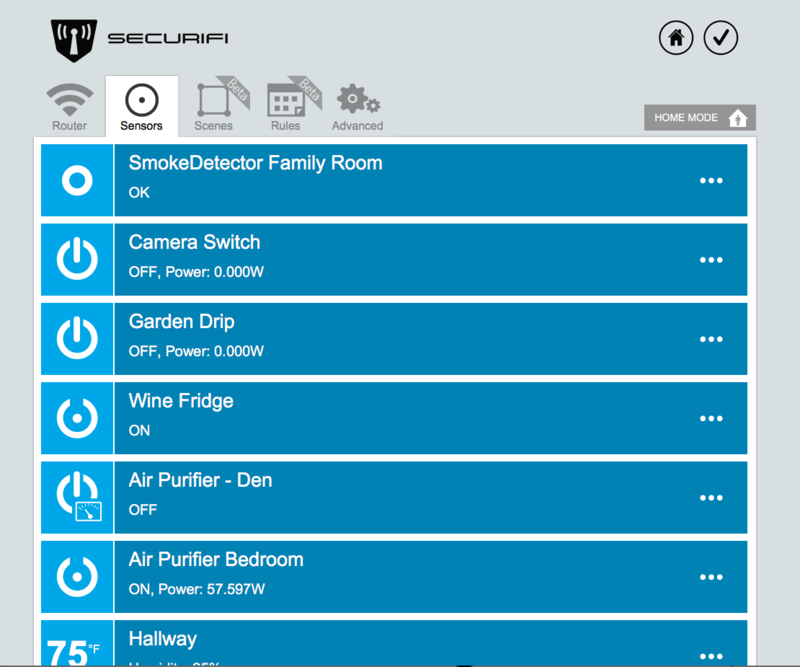 If you are are a more serious home automation enthusiast, I suggest looking elsewhere unless or until Securifi is able to enhance the Almond+ firmware. For more information on other home automation hubs that might be best for your specific needs, see the Darwin’s Den Best of the Home Automation Controllers and Home Automation Hub Feature Comparison Table pages. For the current price of the Almond+, you can purchase a comparable performance wireless router, and a generally more capable home automation controller, such as the Samsung SmartThings Hub. I’m still using the Almond+ as our home’s main wireless router, but no longer for our primary home automation needs. It felt a little wrong to me to return our SmartThings Hub into operation by connecting it to an Ethernet port on the Almond+, but I’m sure I’ll get over it.